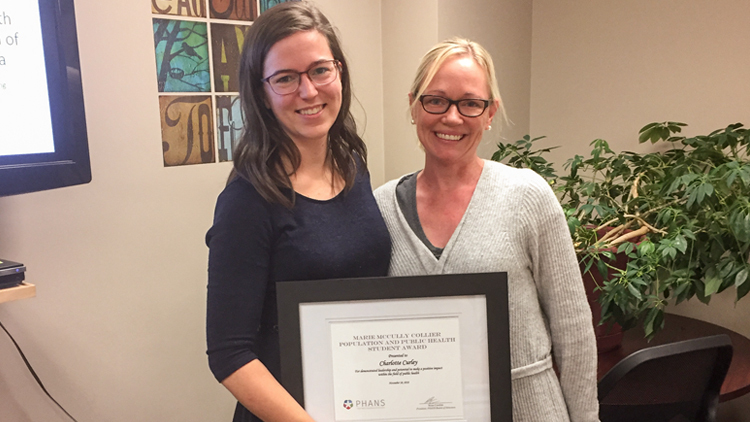 Just days before her StFX graduation with an honours degree in the Advanced Option nursing program, Charlotte Curley, a StFX Rankin School of Nursing student who graduated on Dec. 1, 2018 at Fall Convocation, had more to celebrate when she learned she had won the Marie McCully Collier Population and Public Health Student Award from the Public Health Association of Nova Scotia. Ms. Curley was in competition for the honour with undergraduate and graduate students across Nova Scotia. “I was honoured and excited to receive this award. This award affirms the work I have done so far and indicates that I am on the right path for my future career. I feel that it reflects my potential in the field of public and population health,” says Ms. Curley who in January 2019 will start her career as a registered nurse on the maternity unit in the Dr. Everett Chalmers Regional Hospital in Fredericton, NB. In the new year, she will also edit and submit her thesis for publication in the Canadian Journal of Public Health. She also hopes to present her research at the Canadian Public Health Association annual conference in April 2019. Her supervisor, Rankin School of Nursing professor Sionnach Lukeman, had much praise for Ms. Curley, who was also the only student in her AO class to complete an honours thesis. “Typically, students in our accelerated program do not do a thesis due to the demands of the condensed program. However, Charlotte presented a case for how she could manage, and we developed a plan to make it work. While doing this research project, she was also in my “advanced population and public health” course, and I could see how her passion, dedication and intellectual capacity was working together in a symbiotic way,” Prof. Lukeman says. Prof. Lukeman says as a new graduate who is considering a masters and working in public health, the opportunity to participate in the dissemination of research results with leading researchers in this field in Canada will be invaluable. Ms. Curley says by completing her honours thesis, she has achieved two important professional goals. “I had the privilege of working alongside an incredible teacher and role model, Sionnach Lukeman. We developed a symbiotic working relationship and I now have a valuable personal and professional relationship with her,” she says. Ms. Curley, originally from Tara, ON, has lived in Antigonish since 2011 and has completed two honours degrees from StFX. In May 2015, she graduated with a Bachelor of Arts in psychology, with first class honours.